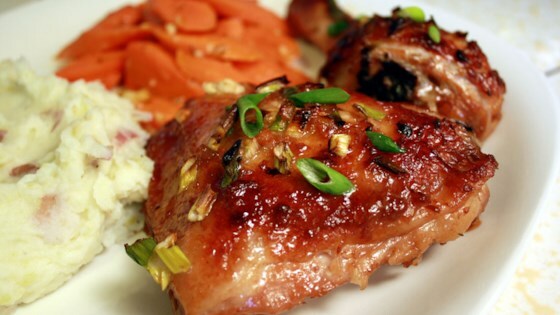 "A marinade of honey, ginger, soy sauce, onion and garlic give this chicken dish an authentic Asian flavor without a lot of fuss." To Marinate: Arrange chicken pieces in a 9x13 inch baking dish. In a small bowl combine the onion, soy sauce, ginger, garlic and honey; mix together and spoon mixture over chicken. Cover dish and refrigerate to marinate for 1 hour, turning pieces once. Bake chicken at 425 degrees F (220 degrees C) for 30 minutes. Turn pieces over and top with green onion, then continue baking for about 10 to 15 minutes, or until chicken is tender and cooked through and juices run clear. Serve immediately. This dish was okay, but I think the baking temp is too high. The sauce burned in the first round of baking and made a mess of the pan. I made it for my family and they loved it. They were surprised that a 13 year old could cook that good. This recipe did not have enough marinade to use as a sauce after cooking. I simply doubled the sauce to spoon over my famous ginger rice.......YUM!!!!!! Had an excellent flavor. I used ginger from a jar in the fridge, and I think when using that type, less of it is required. Maybe half the amount.